I am so happy to announce that I was a guest blogger to the famous Asian food blog, “Rasa Malaysia”. A sweet girl named Bee, who recently became a proud mother of cute baby boy, is the author of that blog and I was thrilled to be invited. Her blog is awesome. Thanks, Bee. I had a fun working on this recipe for you. Wow, this will be the shortest post I have ever created in my blog. Well, Have a fantabulous weekend, y’all! « Korean spinach my way, Popeye! where are you? i love simple dishes like this. rice makes everything delicious! Yes, it does. I can't imagine this world without rice! Great work. 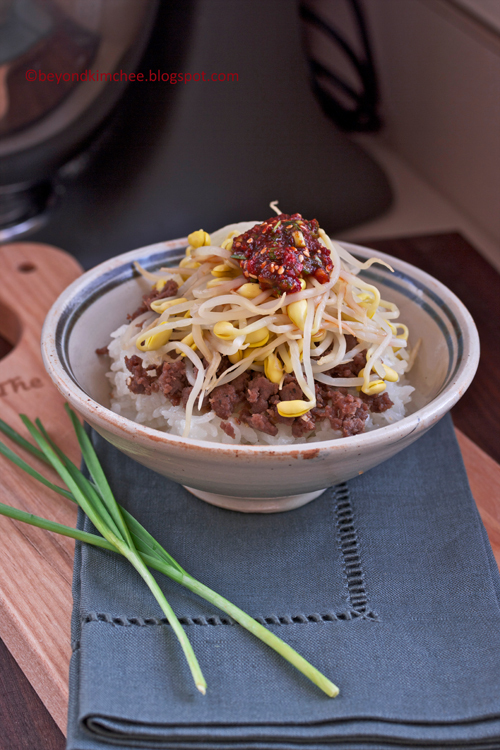 Beautiful blog with simple yet fascinating korean recipes. Your tips are valueable for me and your step by step pictures are simply captivating. I love korean food. Thumbs up ! I have lots of recipe ideas and tips, and happy to share with people who loves Korean food. You are the best: you bring this yummie recipes and they immediately become an object of desire from must-do-soon recipe list. Wonderful guest post and endlessly proud of you! Have a fantastic week, dear friend!